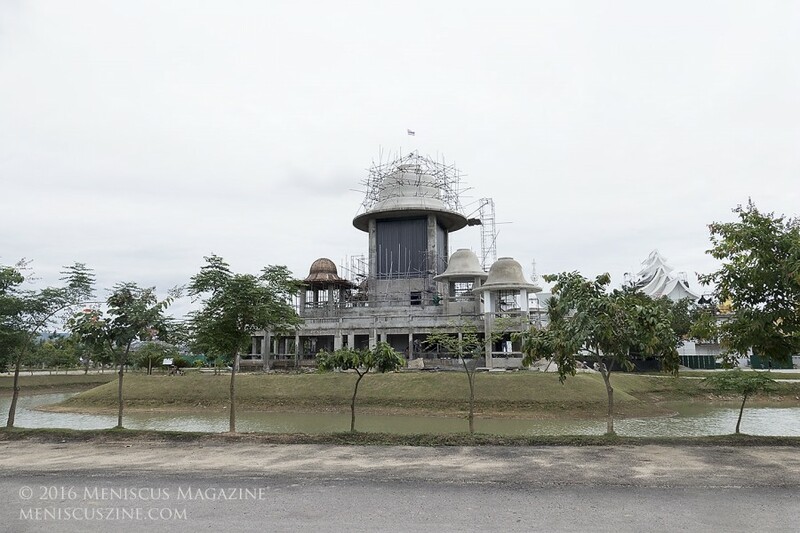 This article was originally published on May 30, 2014, and was updated in 2016. 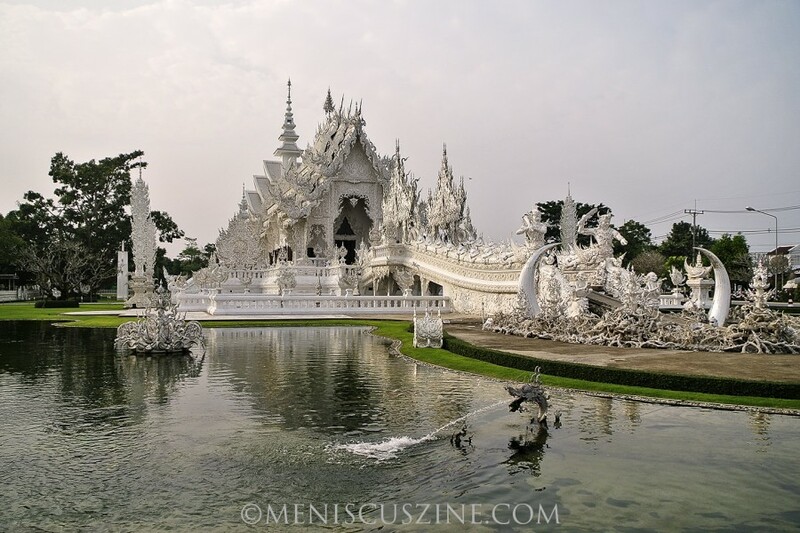 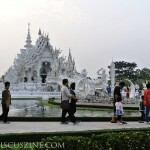 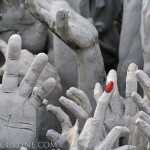 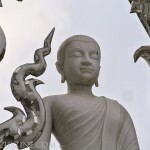 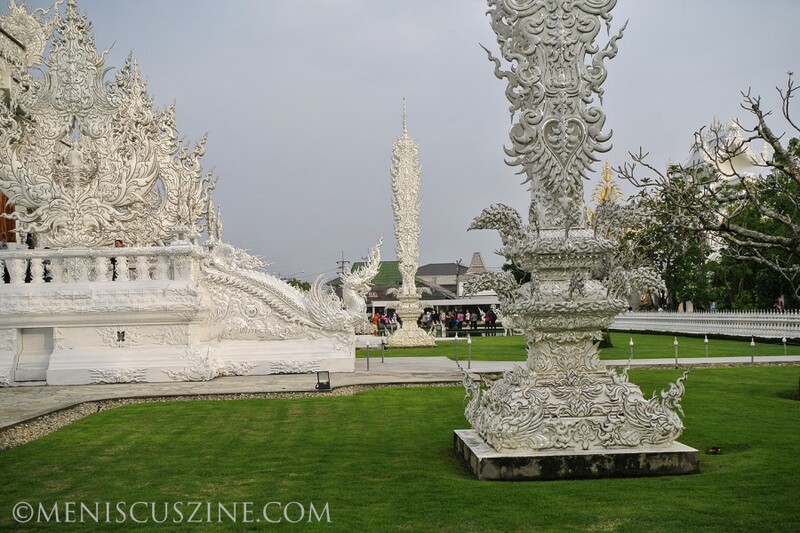 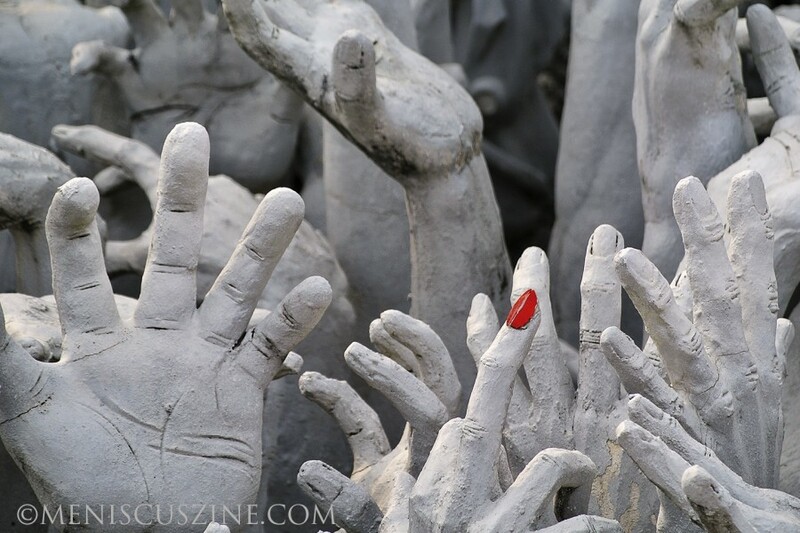 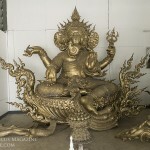 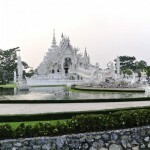 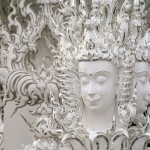 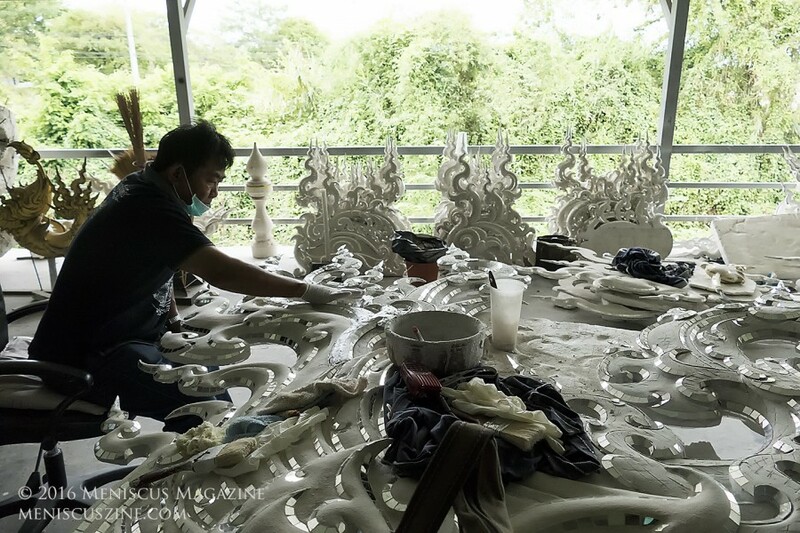 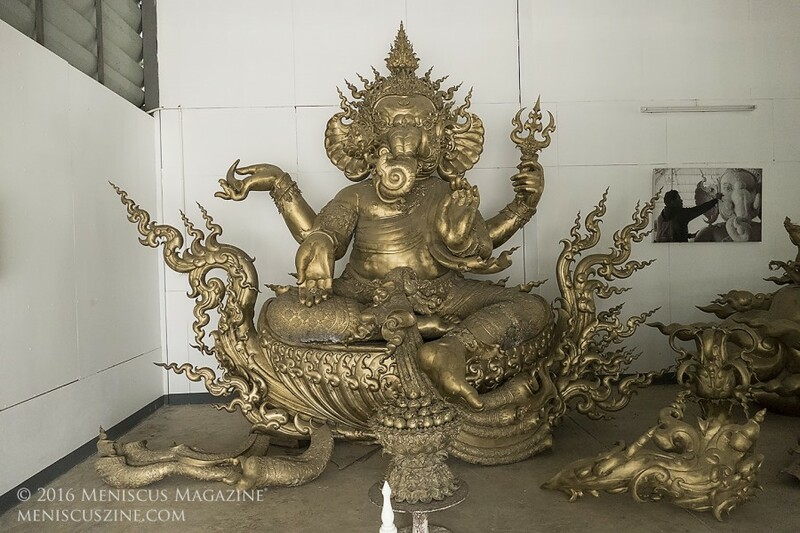 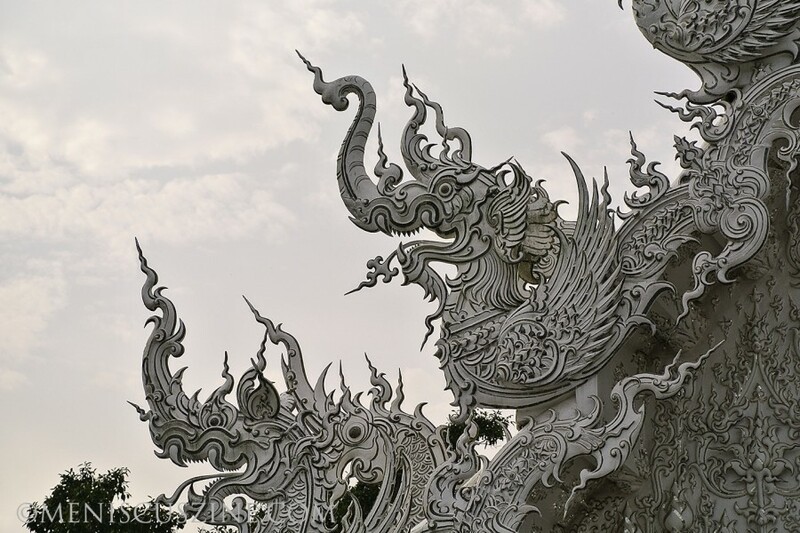 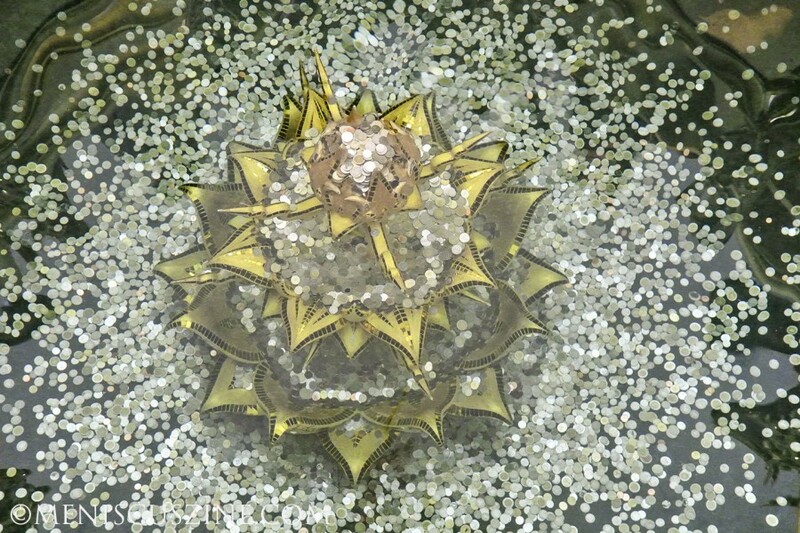 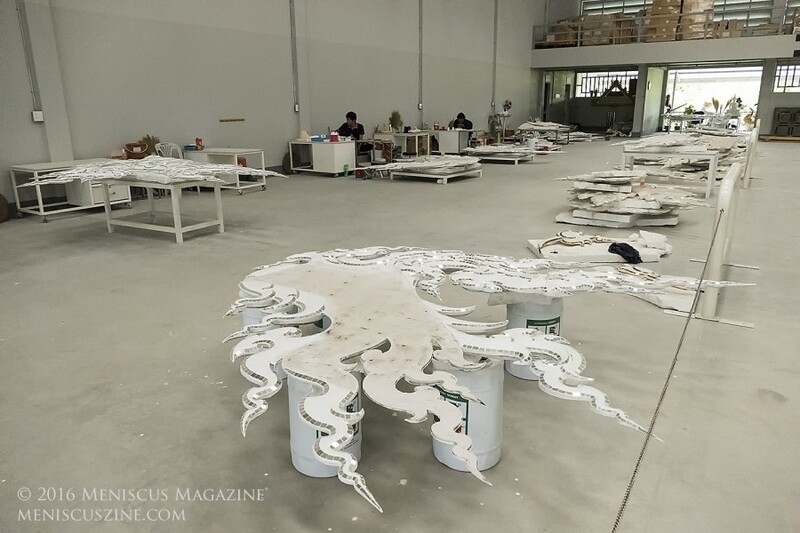 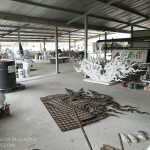 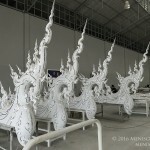 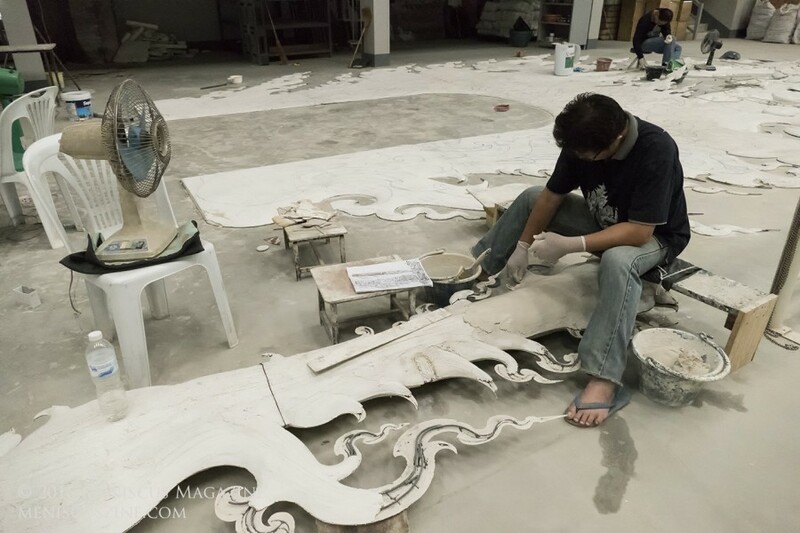 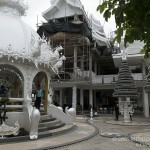 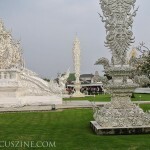 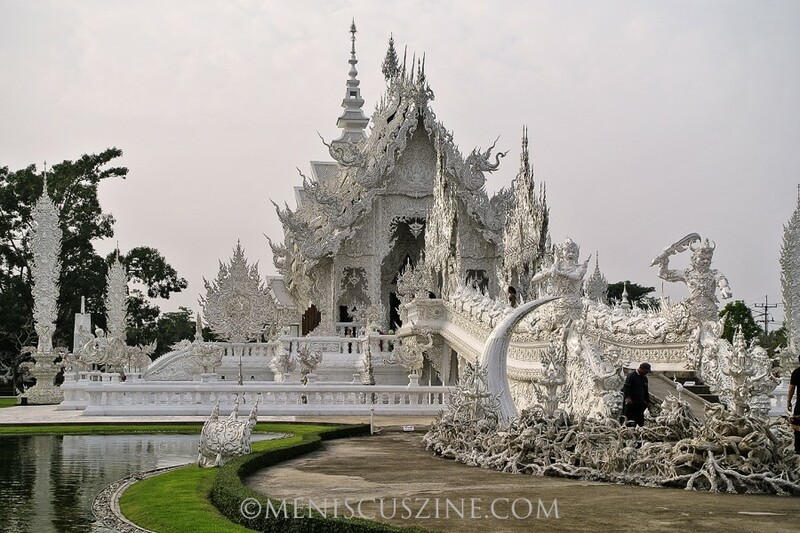 Mostly recovered from the 6.1 earthquake that hit the northern Thailand town of Chiang Rai on May 5, 2014, Wat Rong Khun (วัดร่องขุ่น), also known as the White Temple, is an unusual work-in-progress that the lead artist hopes will continue expanding at least six decades after his passing. 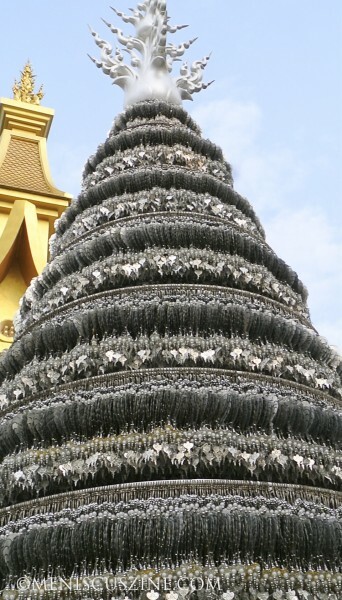 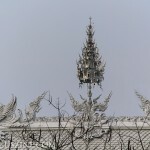 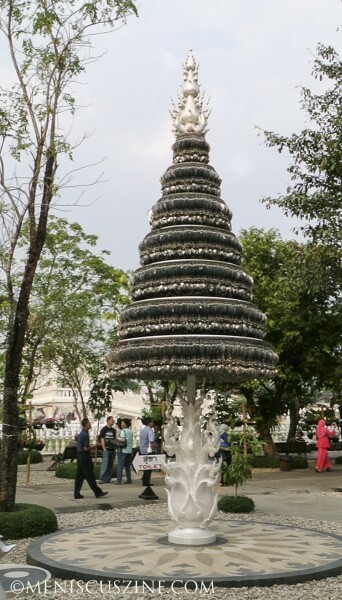 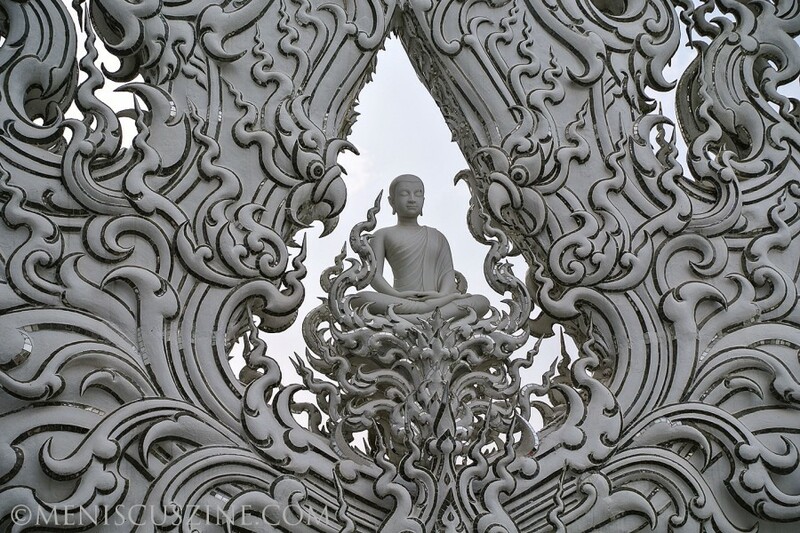 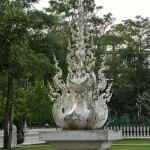 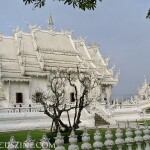 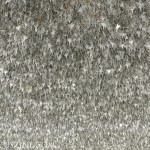 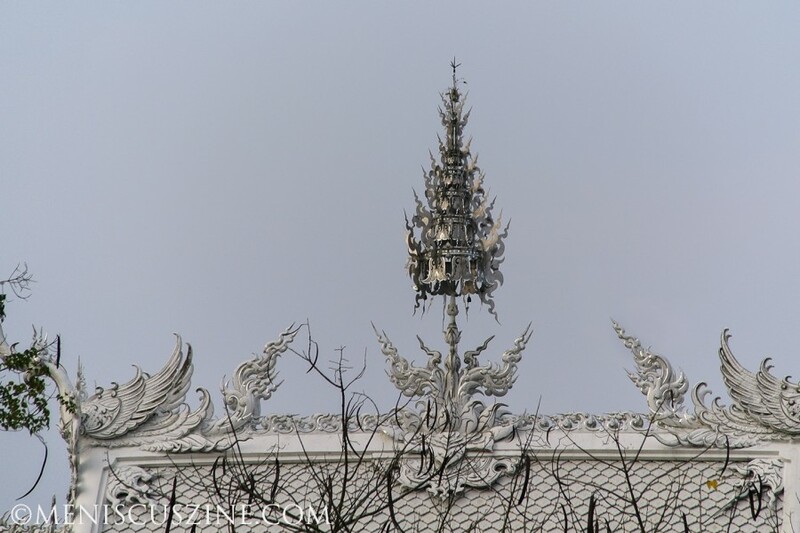 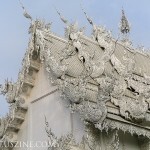 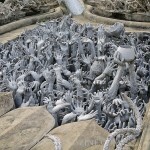 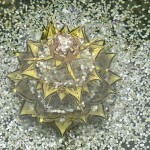 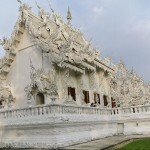 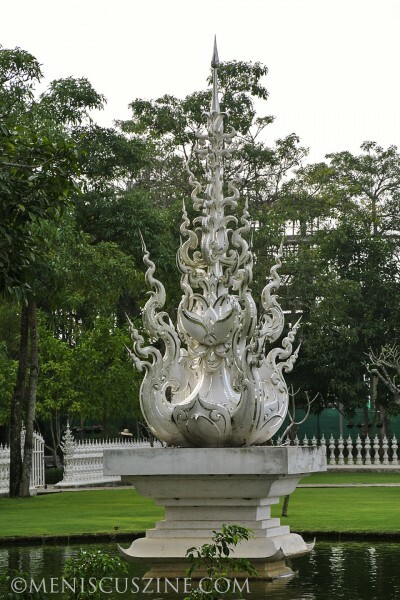 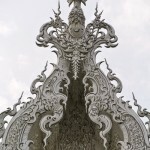 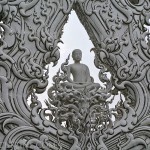 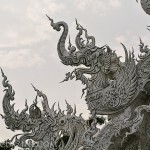 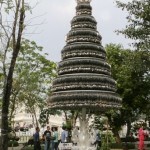 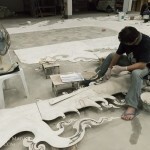 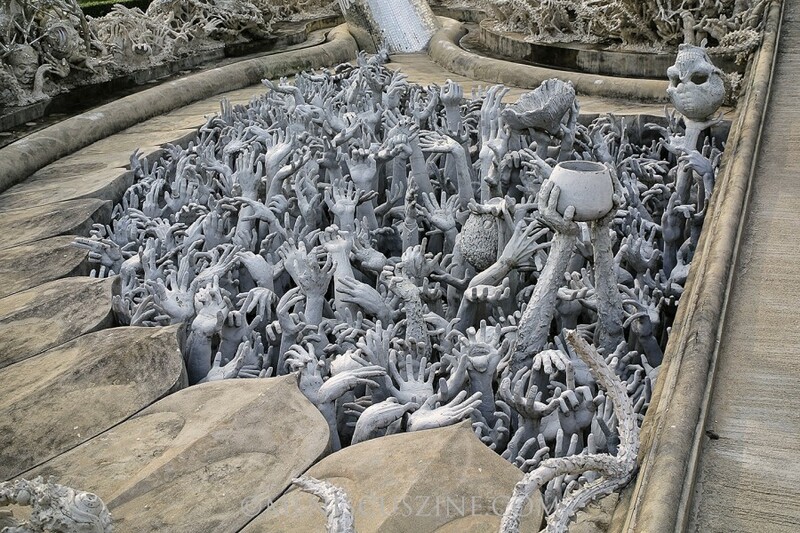 While sources have cited that the structures incorporate an unusual combination of Buddhist and Hindu architecture, on the official Wat Rong Khun website, Thai artist Ajarn Chalermchai Kositpipat and his staff of 80 draw heavily from his studies in Thai Buddhist arts for the design of the temple, which began in 1997. 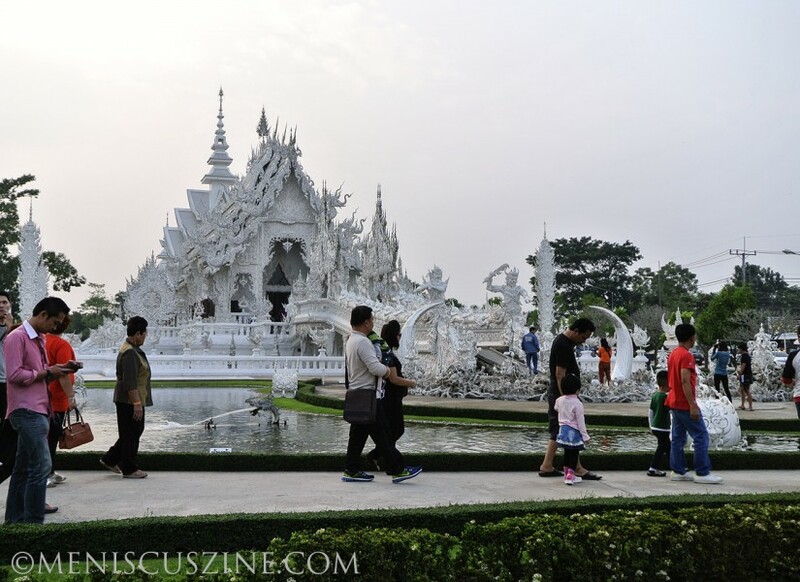 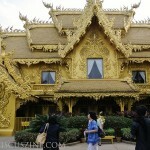 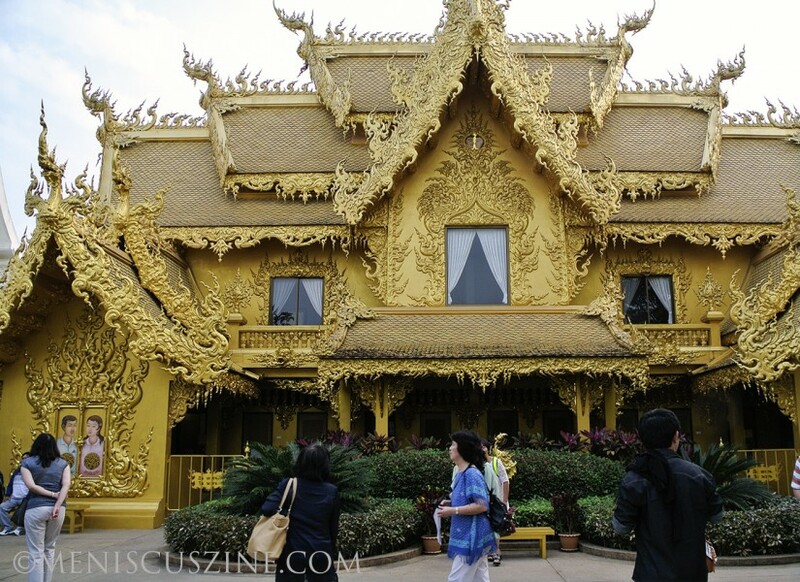 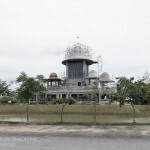 Tourists are not allowed to take photos inside the temple, which is a shame because, in contrast to the White Temple’s exterior, colorful murals depict all sorts of imagery not associated with Buddhism, such as spaceships, Gundam and actor Keanu Reeves. 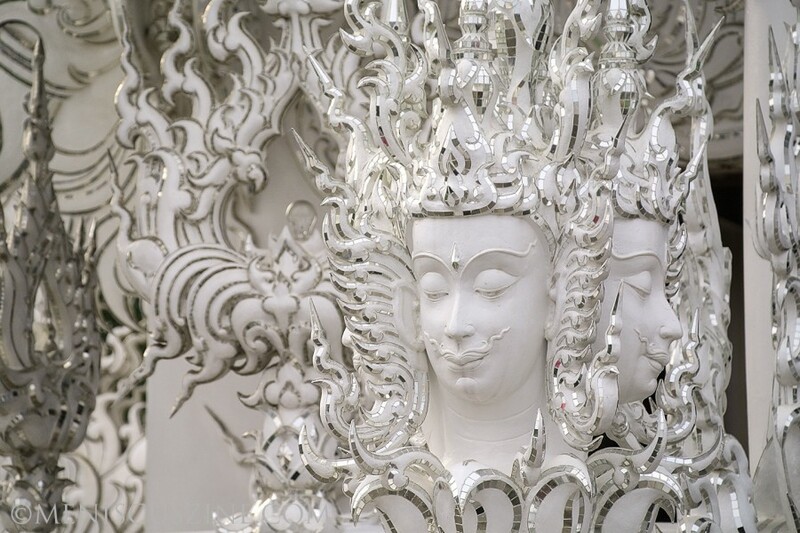 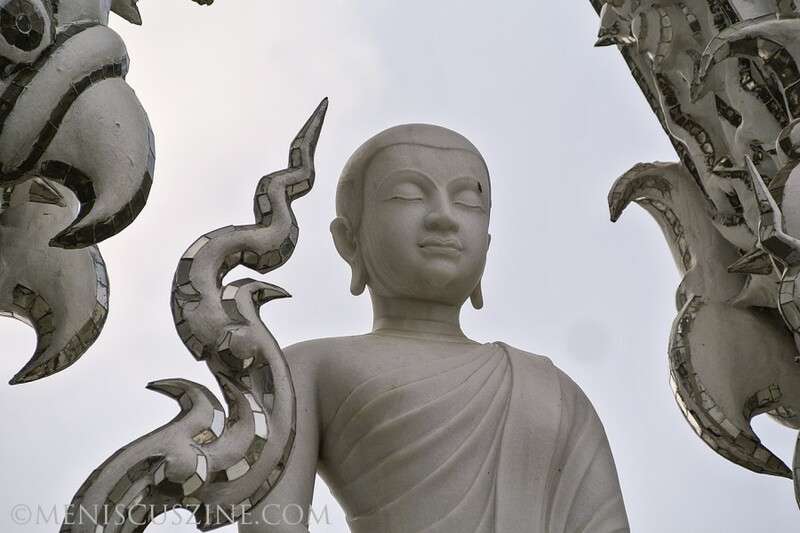 One of the star attractions of the White Temple, Kositpipat continues to add depictions of noted figures, cartoon characters and Hollywood film references to the walls. 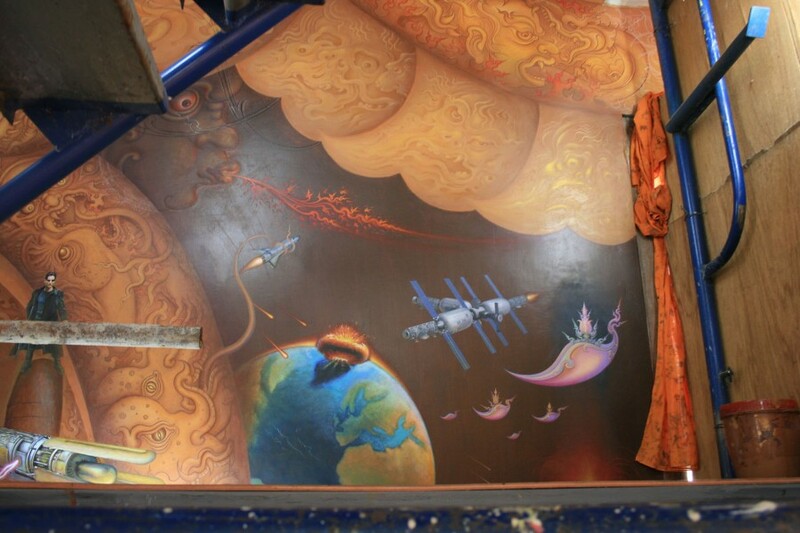 Although these references appear to be humorous, one notices the burning World Trade Center twin towers amid the pop culture imagery. 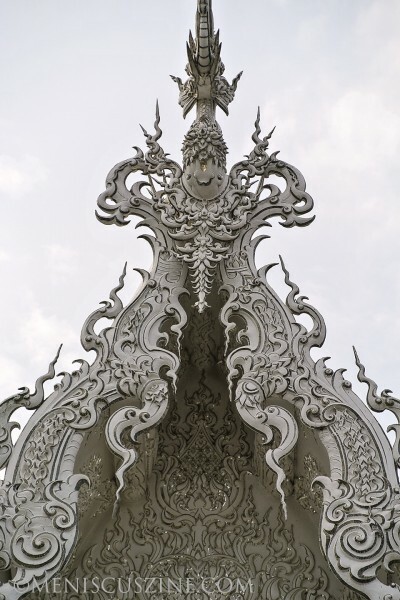 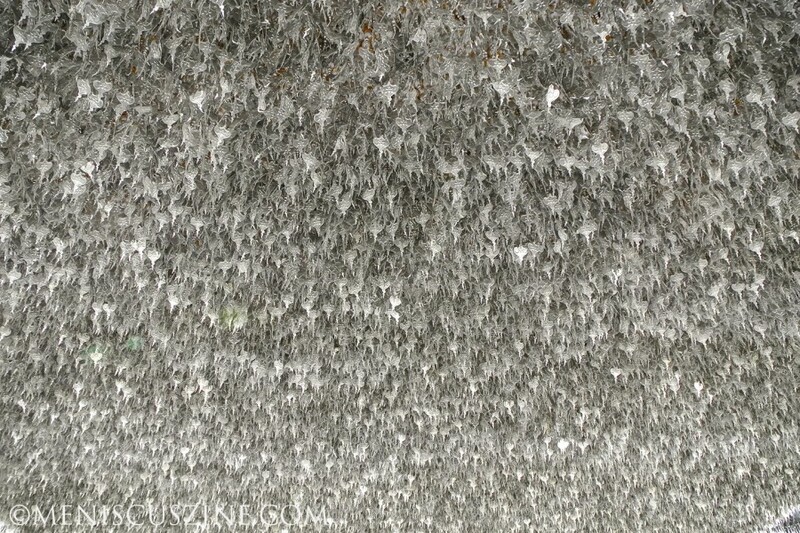 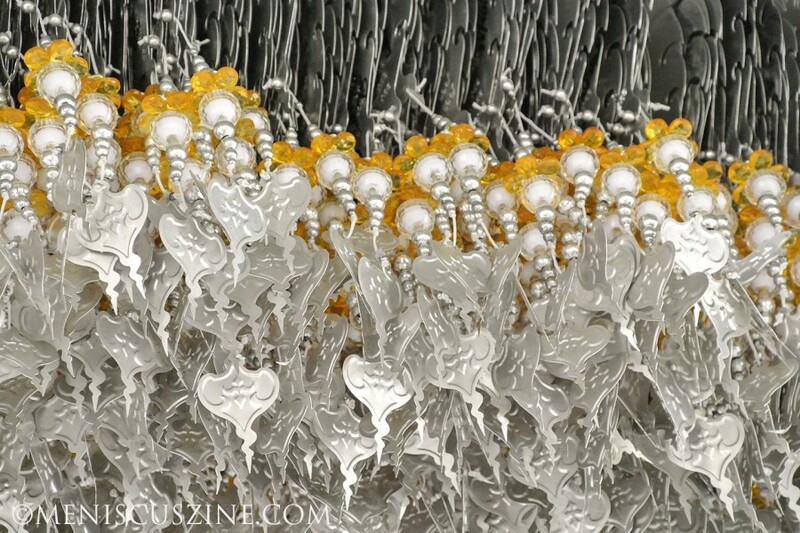 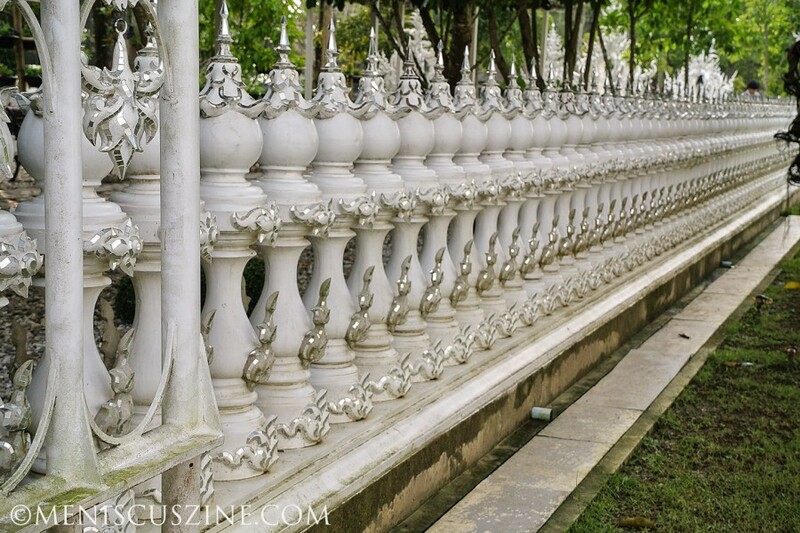 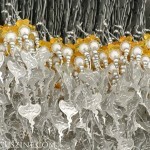 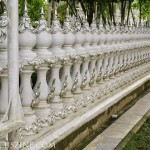 Still, there is plenty to see outdoors, with fantastical facades revealing intricate details. 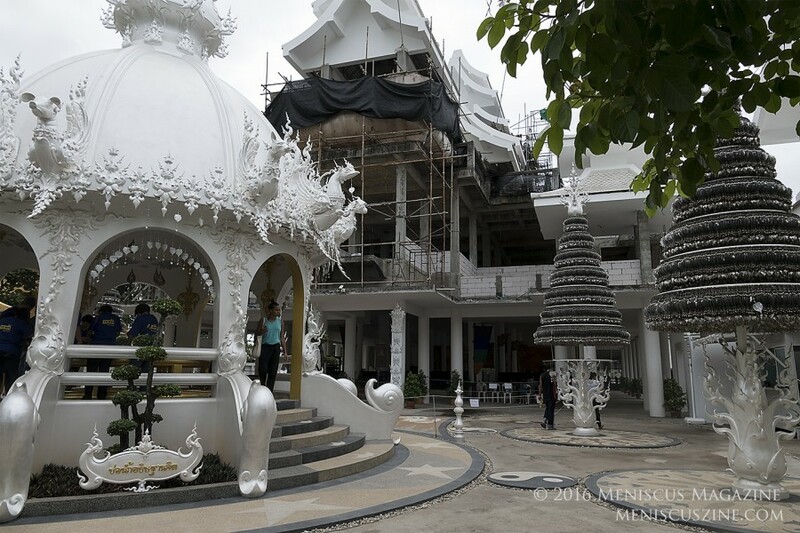 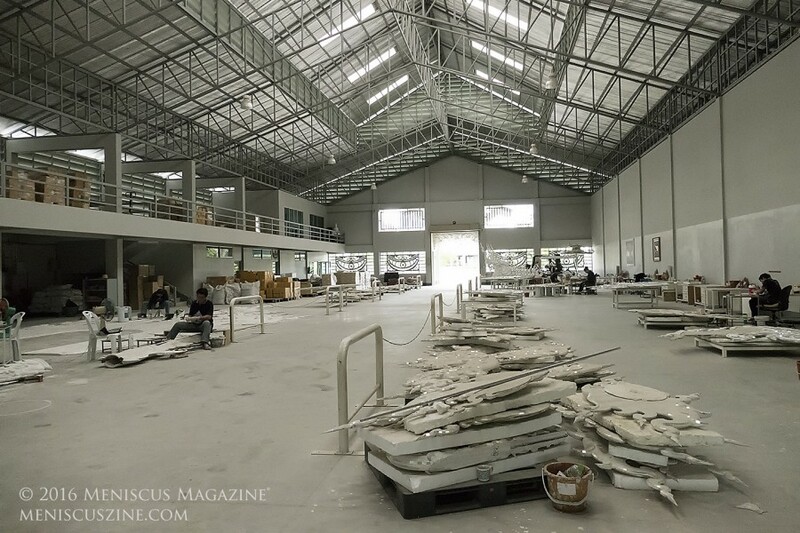 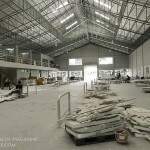 The annual rainy season can easily damage the surface of a predominantly white sprawling complex, so Kositpipat’s staff undergo three major cleanings after the rains subside, winter and the Songkran Thai New Year holiday in mid-April. 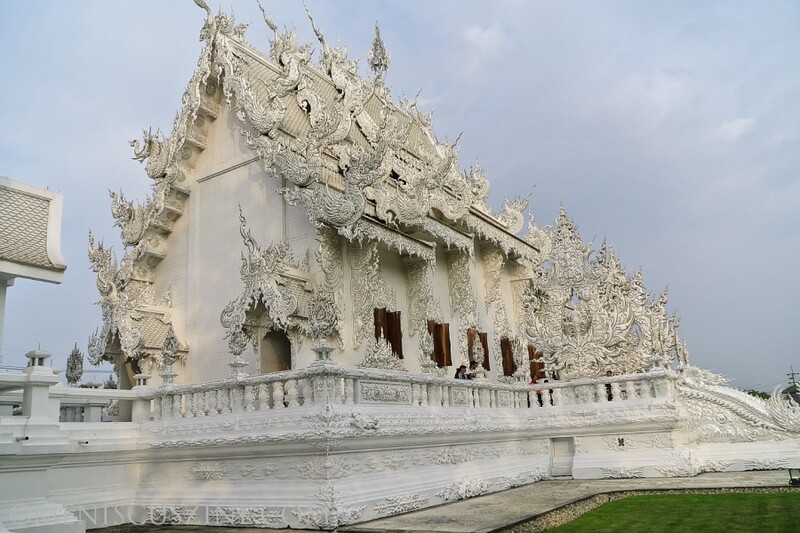 Admission to the White Temple is free and is open daily from 6:30 a.m. to 6 p.m. 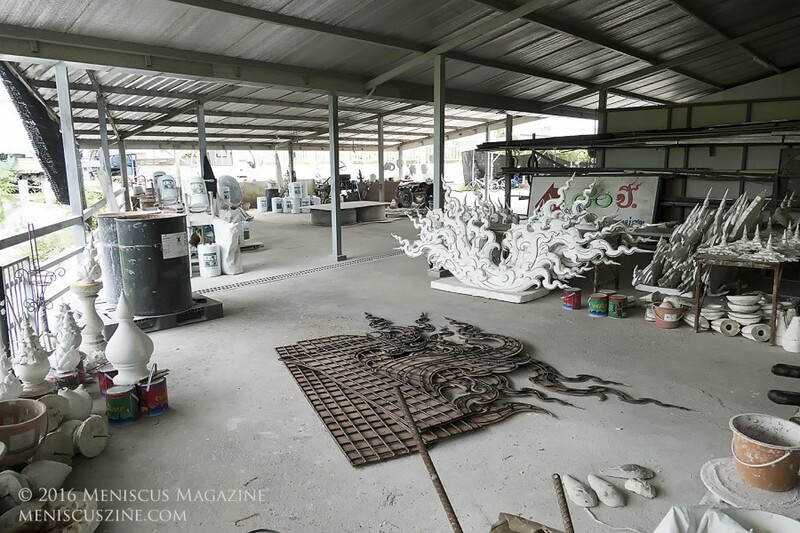 The complex includes a highly-recommended gallery that includes Kositpipat’s works from his student days at Silpakorn University until now, and provides a better sense of the artist’s influences on his architecture. 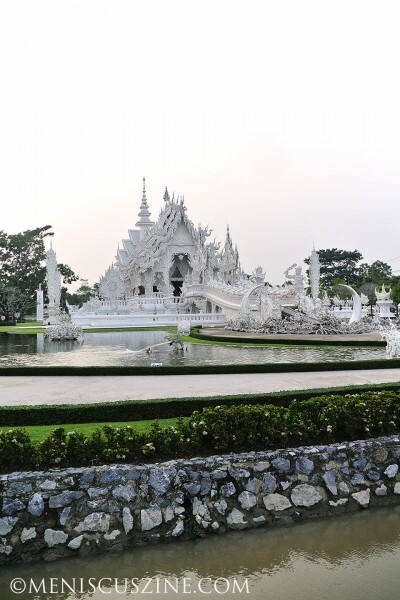 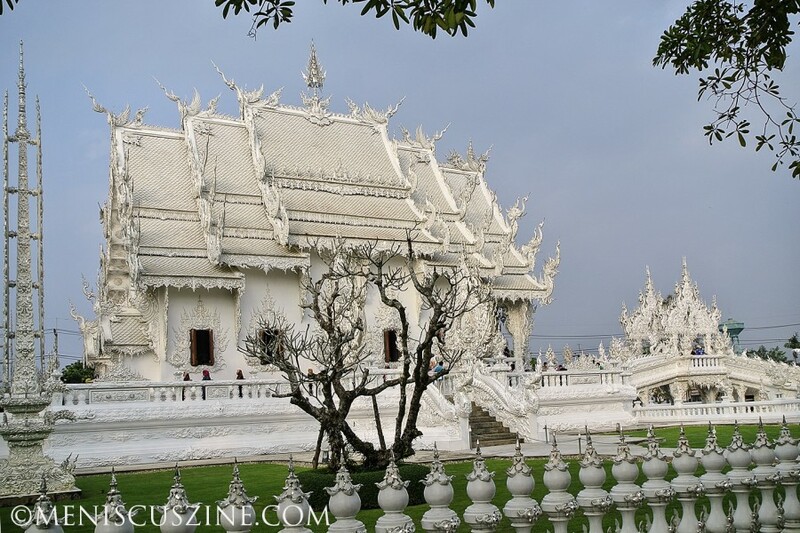 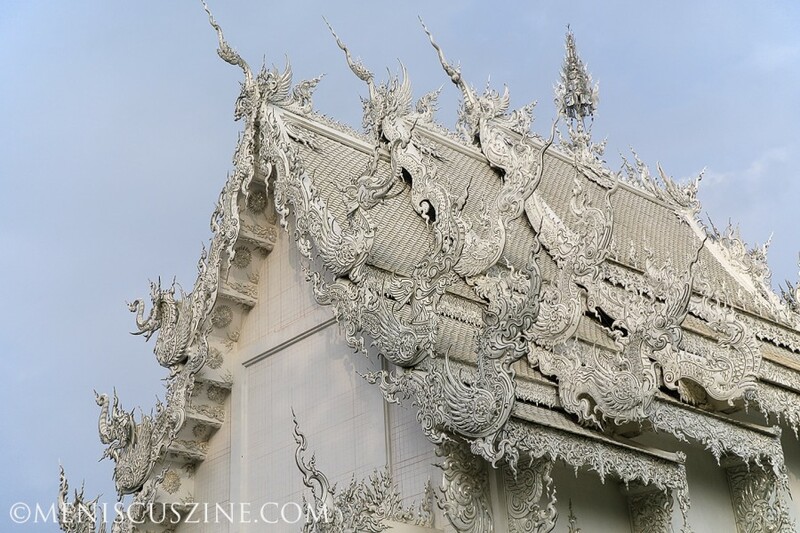 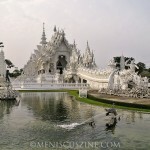 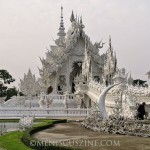 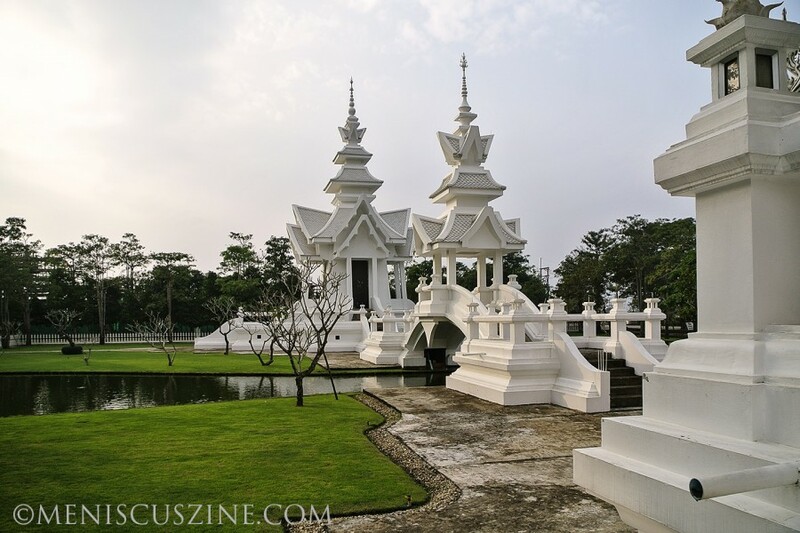 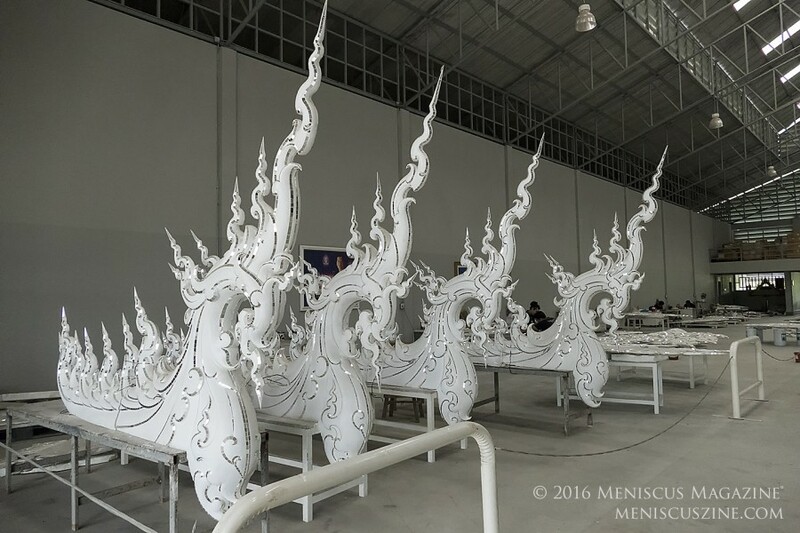 The gallery is open Monday to Friday from 8 a.m. to 5:30 p.m., and weekends and public holidays from 8 a.m. to 6 p.m. To get to the White Temple, take a bus from Chiang Rai going toward Chiang Mai or Phayao, and ask to stop at Wat Rong Khun (in Thai: วัดร่องขุ่น). 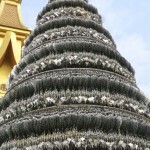 Another option is to take a taxi from Chiang Rai.